With five carefully selected documents per chapter, this two-volume primary source reader presents a wide range of documents representing political, social, and cultural history in a manageable, accessible way. Thirty-two new documents infuse the collection with the voices of an even wider range of historical actors. 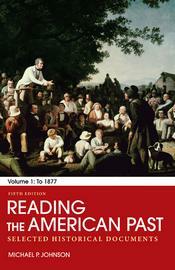 Expertly edited by Michael P. Johnson, one of the authors of The American Promise, the readings can be used to spark discussion in any classroom and fit into any syllabus. Headnotes and discussion questions help students approach the documents, and comparative questions encourage students to make connections across documents.